You’ll come to the first page of settings. You can cycle through the various options by pressing the > (next) and < (previous) keys. Needle Position – Up or Down: Sets the position of the needle when the machine stops. Width Control – On or Off: If this setting is “Off,” the sewing speed controller is used to change the speed of the stitching. If you turn it “On,” you can use it to quickly and easily adjust the width of the stitch while you’re sewing. This is useful for creating decorative stitches. In this case, you need to use the foot controller to control the speed of sewing. This function is only used for sewing because in embroidery the stitch width is controlled by the design itself. For more details, see page 58 in the Operation Manual. Needle Count. The LCD display shows the current stitch number / total stitches while embroidering. The stitch number is useful to know in case something happens during the embroidery. Then you can fix the problem, back up a few stitches and start stitching again. If you have to turn the machine off, note this number and you can advance by color and/or by stitch to get back where you were without having to start over. Number of Color. Displays the thread color number. When this is selected, you can choose the brand of thread with the second line of settings. This is only useful if you use one of the thread brands in the list. Name of Color. Thread color name. I don’t find this very useful because I use a different brand of thread than it knows about. So it maps the color information to Brother’s thread colors and always gets it wrong. Time. I’ve never used this and don’t really know what it is. The third line on this screen lets you change the units from inches to millimeters (mm) (1 cm = 10 mm if you need to convert from centimeters). Buzzer. On or Off. By default, the machine is set to beep once whenever you press a control or beep more times if there’s an error. You can turn the beeps off here. Initial Position. Sets whether the embroidery pattern is positioned in the center (default) or lower left of the embroidery frame when you select a pattern. You can change the position for each design using the Adjust > Layout functions. English. You can change the language to many others. You can change the brightness of the LCD display. NO. This is the machine ID which is unique to your machine and is different than the machine serial number. It is used to license designs from Brother’s ibroidery.com site to your particular machine. Version: The version of the software in the Brother SE400. I could find hardly any information about the settings in the manual. So I hope this helps. You can return to the home screen with this button. Help! I’m new to sewing/embroidery! I got the Brother SE400 for Christmas. I am trying to embroidery initials. The first set of stitches around my letters are great they are the color there supposed to be but when I go for the last stitch to complete my project (zig zag) stitch I think is what it’s called it picks up the thread from by bobbin which is white. I don’t know what to do! I am trying to change mm to inches and can not find a way also want o change the needle position to center as the default. Any help would be appreciated thank you ! Hi Karen. Has anyone answered you yet? I have been working with my SE400 for a couple months and just found this site. I don’t know of a way to change between metric and standard measurements in machine. I used Sophiesew and have started using Sew What Pro software to let me manipulate designs. It gives both types of measurements. Sew What is nice that it will tell you if the design is too large for your hoop. Not sure what you are asking about needle position. Do you mean when the machine is embroidering the design? The embroidery file determines where the needle starts and how it travels to make the design. Hello, above in the screen 2 section, just under the Time setting, it tells you how to change the measurement setting. Is there an applique stitch on this machine or can you change settings on the zig zag stitch to use for applique? How do I set up the zigzag stitch? My first time and I’m perplexed…I got it to sew Hi on the hoop but I want a little phrase and cannot figure it out. I want to reduce the size of the letters and put more words in it. 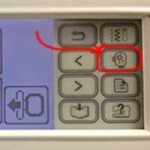 Is there a way to put spaces between letters or words on a Brothers Se400 embroidery machine? On the screen with the letters and numbers, there is different signs the one that works for me is the one that looks like and underline line. After completed design just clip the underline marking out with scissors.